We are also certified installers of irrigation systems. We install Hunter irrigation heads and clocks. However we are able to service all types of irrigation systems. It is a great choice to install a system of your own to keep your yard and gardens looking lush and green all season long. 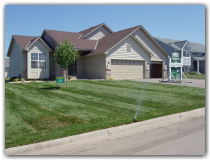 Each system is customized to your yard to make sure that everything is kept looking its best. Maybe listening to the soft sounds of water running through natural rocks is more appealing to you. We can also build and install custom waterfalls and ponds for you. Fill you ponds with stunning water plants and surround the waterfall with tropical greenery. We also service your water features to keep them up and running the way they should. A water feature will for sure be the highlight of your yard and something to enjoy for many years.